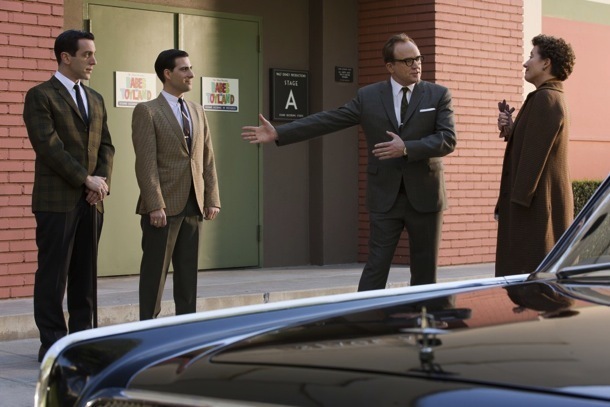 Today, here are quick mini-reviews for: Saving Mr. Banks and American Hustle. Starring: Tom Hanks (The Green Mile), Emma Thompson (Nanny McPhee), Annie Rose Buckley and more. Rating: Rated PG-13 for thematic elements, including alcohol use, mild language and more. One of my most anticipated films of the holiday season, Disney’s film about the making of one their most beloved films did NOT disappoint. Oftentimes, movies about the making of a movie turn out to be either mildly entertaining, to change their focus to that of the filmmaker or simply turn into a documentary. For example, Hitchcock, about the making of Psycho, turned out to be more of a biopic of Alfred and Alma Hitchcock (my review HERE) and less about Psycho. Disney’s latest blends the making of with the story of its creators and is not only the story of how Mary Poppins came to be a movie, but also the journey of the filmmaker and storyteller. Saving Mr. Banks is enjoyably heartwarming “in the most delightful way”; truly a work of art unlike several other films of its kind. This biographical/historical dramedy doesn’t need a spoonful of sugar to help swallow it. It is just as pleasant and entertaining as Mary Poppins itself. With a cast that flawlessly executes each part (Emma Thompson’s performance as P.L. Travers makes it easy to understand and share the frustration of Walt Disney and his screen/song writers in a fashion both comedic and true). One of the most impressive aspects of the film is the use of flashbacks and its back-and-forth storytelling that gives an insight into the stuck-in-her-ways author and provides an understanding of her character, passion and past throughout. Tying audiences to her emotionally and making the predictable storyline stronger (seeing as we all know that the movie got made in the end…spoiler alert!) haha. All of the acting and interaction in the film comes across as natural in both stories of the past. The connections sought and acquired will spark laughter, sadness, smiles, tears, frustration and elation throughout this wonderful story. The film also manages to create connections with events of the past with the beloved childhood movie’s songs/characters and makes it all the more special to watch Mary Poppins again. The trifecta of P.L. Travers’ story (and thus the true meaning of the title of the film), Walt Disney’s desire/dedication and the making of Mary Poppins is a solid formula for success. 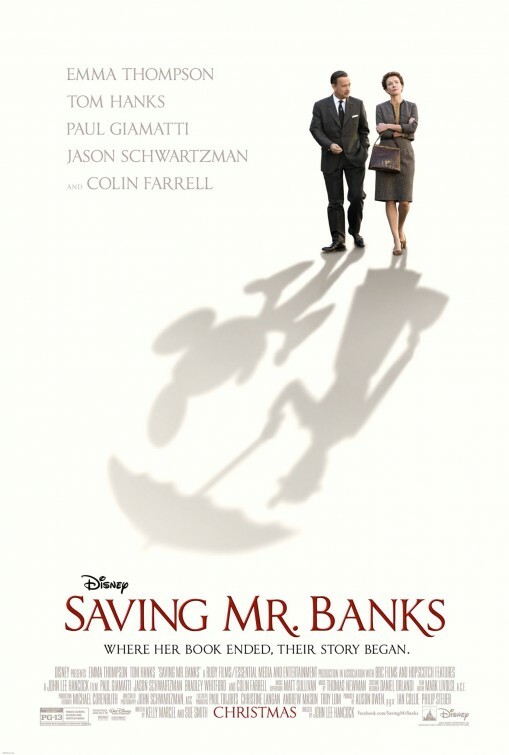 I just can’t say enough about Saving Mr. Banks, I loved it and I think everyone should see this film. The funny thing about all this is, is that without the film Mary Poppins, Saving Mr. Banks would not exist, and yet Saving Mr. Banks is a film that manages to improve upon what is already a near perfect classic and perhaps even best it. From now on, every single time you watch Mary Poppins, the many events and ideas of that film will take on a whole new meaning. In fact, I can’t wait till the next time I see Mary Poppins again to see how it may affect me more strongly on an emotional level now knowing more of the story. 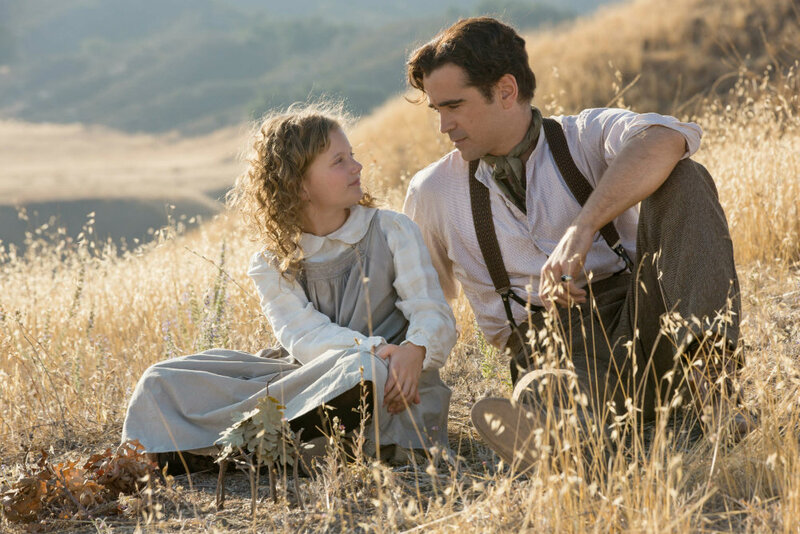 Saving Mr. Banks is just a miraculous kind of movie that we need more of. It’s classic Hollywood drama, so if you want my advice, bring a hankie and just enjoy yourself. Directed by: David O. Russell (The Fighter, Silver Linings Playbook). Starring: Christian Bale (Out of the Furnace), Jennifer Lawrence (Winter’s Bone), Amy Adams (The Master), Bradley Cooper (Limitless) and more. While the synopsis above gives a decent summation, I disagree that it “defies genre” as I would specify this film as a heist movie to be listed among others such as The Sting, Heist, The Italian Job, Heat, Ocean’s Eleven, The Score, etc. David O. Russell reteams with Jennifer Lawrence, Robert DeNiro and Bradley Cooper from Silver Linings Playbook and with Amy Adams and Christian Bale from The Fighter and adds Jeremy Renner, Michael Peña and more to the party to bring this intense story to the screen. Starting slow, American Hustle takes some time setting up the stage for the second and third/final acts. If you can make it through the first act, allowing the strong performances to carry your interest, then the payoff will be worth it come the end. As Russell’s pattern is, this is a film that centers around character first and story second and when those two focuses combine, the result is fantastic. 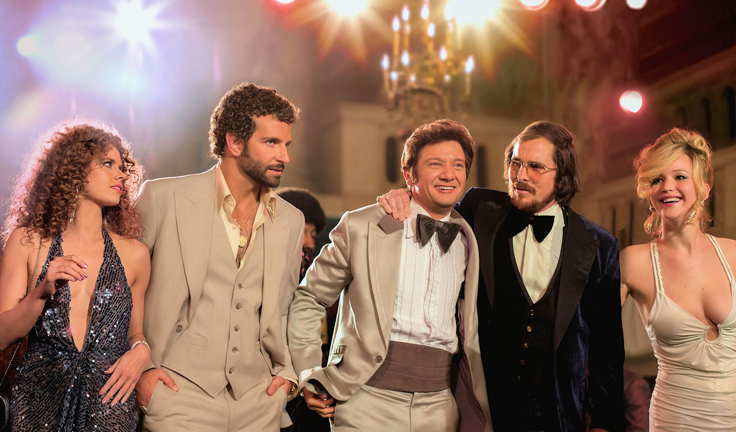 Heist movies tend to be rather predictable to a degree, but American Hustle spends so much more time on the characters than on the story as a whole that when the twists come they are more welcome and surprising. A major amount of credit must go to the cast and the extent they went to in order to bring their characters to life. From Jennifer Lawrence and her Jersey accent work to Christian Bale who shaved the top of his head for an elaborate comb over and gained 40 lbs, to Bradley Cooper keeping his hair in rollers to Amy Adams undoubtedly being cold in all of her outfits with necklines below her bellybutton, the performances make the film and I expect to see a few nominations come Award season. While several other ratings online (i.e. IMDB and Rotten Tomatoes) give this film a nigh perfect score, certain things keep me from doing so. Russell’s focus on character and ignoring of story plotlines in the first act leaves audiences at a loss wondering what is going on (but it is important to pay attention during the beginning as everything plays a role later). The risky tactic of storytelling used makes audiences choose to sit just to understand what is going on instead of enjoying it BECAUSE of what is going on. Granted, the payoff in the end works and since it is loosely based on some events that did occur (as it reminds us at the beginning) the ending is both believable and acceptable. If you are offended by language, then this is not the movie for you to watch. As with Russell’s previous films, profanity seems to be like air as the characters live and breathe 4-letter words. However, the tenacious acting of the entire cast mixed with the fact that there isn’t just one hustle going on, but that everyone seems to be hustling everyone at some point in time, makes the film both intriguing and interesting. 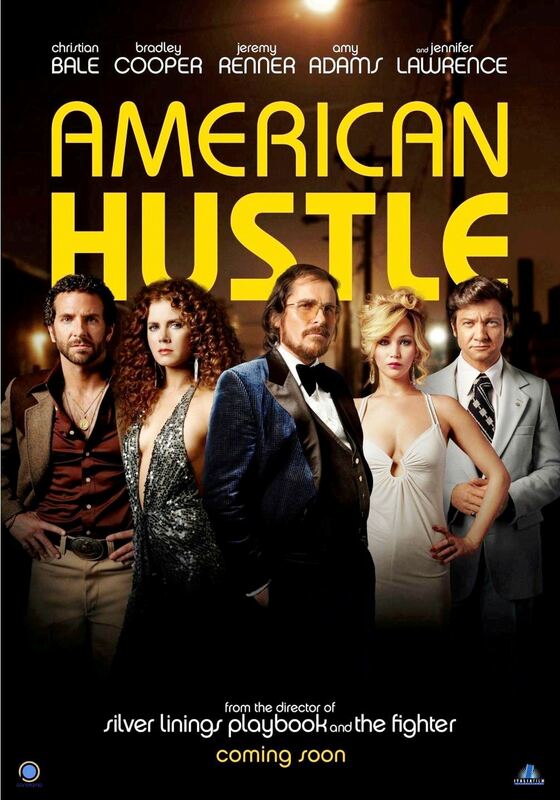 Double-cross, triple-cross betrayals, deception, corruption, bribery and more, American Hustle has so much drama that leans towards the side of reality as opposed to fantasy and therein finds its overall strength. Definitely a strong film and contender for performances. It suffers in overall story but makes up for it as the plot thickens. Short of great, yet still original and subtle that pays off come the end. Nice T! I can’t wait to see Saving Mr. Banks, and that is a pretty perfect review of American Hustle. I wasn’t as impressed with it as much as I was assuming I would be, simply because the story did take a backseat. performances were amazing though, no doubt about it. I felt David O. Russell was making an attempt of making Scoresese type film with an intricate plot that for the most part succeeds. I agree its the performances that elevates this film. Great review. Well, “T” as promised I would review the site of which I must say I’m impressed with your body of work thus far and wish you the best. 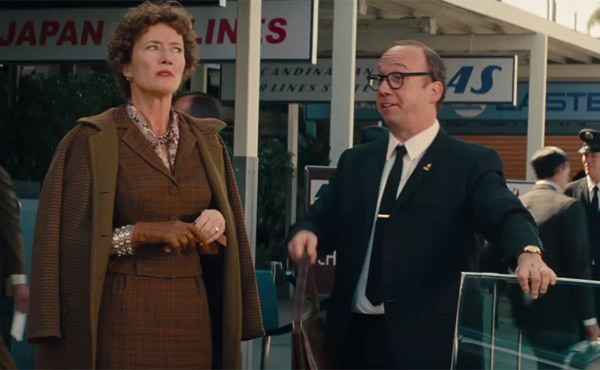 With regard to the review of “Saving Mr. Banks” I believe you are spot on, I like the multiple levels of tension the film brought forward with the characters and in Disney fashion, actually created a film in the 21st century with no swearing, bravo “Disney” for retaining the image “Disney” created so many years ago. What is interesting with other reviews, is they want to interject where we are presently on social issues and and throw mud on the past as if they were there in the 1940’s during the upheaval with a world at war. This is our history, and we continue to be the country other individuals want to flock to for freedom regardless of our past. Thanks for the review, and thanks to “Disney” for continuing to provide quality entertainment. Thank you for visiting and for your kind words. 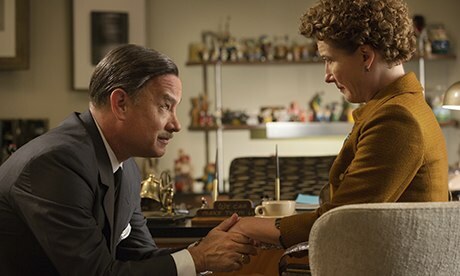 I truly enjoyed “Saving Mr. Banks” and you picked up on a few things that I enjoyed as well such as the look and feel of the film and the time periods it contained. You’re right about our history and it is important to let it be as it was. Preserving our past to protect the future. Tom Hanks has had a great year in terms of movies. Looking forward to seeing Saving Mr Banks. Heard mixed things about American Hustle – some proclaiming it the best O’Russell has done so far, others saying it is his weakest. Guess I better check it out quick.